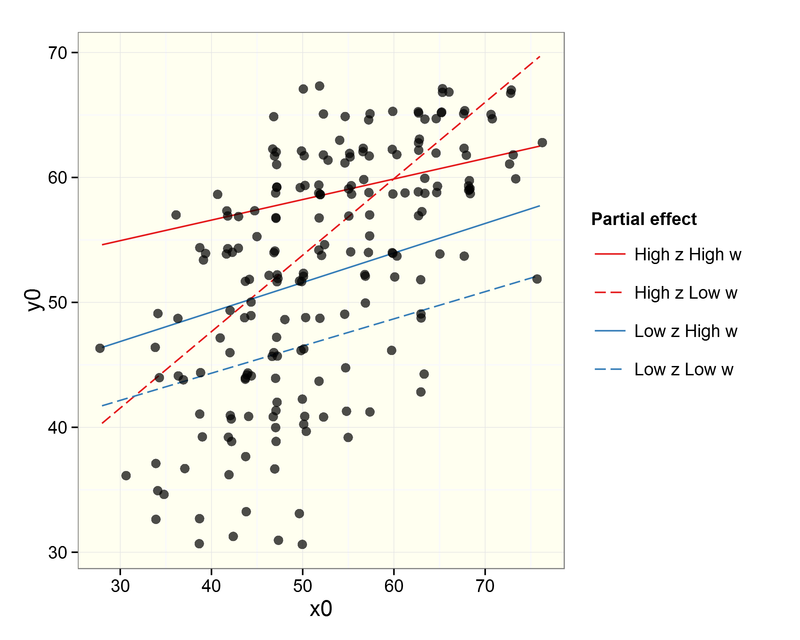 It can be pretty tricky to interpret the results of statistical analysis sometimes, and particularly so when just gazing at a table of regression coefficients that include multiple interactions. I wrote a post recently on visualising these interactions when variables are continuous; in that instance, I computed the effect of X on Y when the moderator variables (Z, W) are held constant at high and low values (which I set as +/- 1 standard deviation from the mean). This gave 4 different slopes to visualise: low Z & low W, low Z & high W, high Z & low W, and high Z & high W. It was simple enough to plot these on a single figure and see what effect the interaction of Z and W had on the relationship between Y and X.
I had a comment underneath from someone who had a similar problem, but where the interacting variables consisted of a single continuous and 2 categorical variables (rather than 3 continuous variables). Given that we have distinct levels for the modifier variables Z and W then our job is made a little easier, as the analysis provides coefficients for every main effect and interaction. However, each of the categorical modifier variables here has 3 levels, giving 9 different combinations of Y ~ X. While we could take the same approach as last time (creating predicted slopes and plotting them on a single figure), that wouldn’t produce a very intuitive figure. 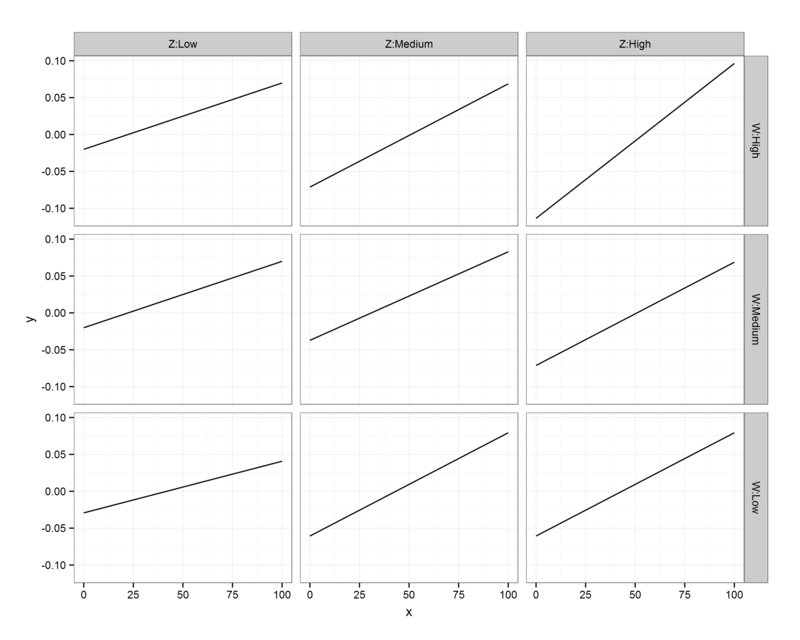 Instead, let’s use ggplot2’s excellent ‘facets‘ function to produce multiple figures within a larger one. Each small figure should have the same measures and scale; once you’ve understood the basis of the first figure, you can then move across the others and see how it responds to changes in a third variable (and then a fourth…). The technique is particularly useful for multivariate data because you can compare and contrast changes between the main relationship of interest (Y ~ X) as the values of other variables (Z, W) change. Sounds complex, but it’s really very simple and intuitive, as you’ll see below! Ok, so the commenter on my previous post included the regression coefficients from her mixed model analysis that was specified as lmer(Y ~ X*Z*W+(1|PPX),data=Matrix). W and Z each have 3 levels: low, medium, and high, but these are to be treated as categorical rather than continuous – i.e., we get coefficients for each level. We’ll also disregard the random effects here, as we’re interested in plotting only the main effects. The reference values are Low Z and Low W; you can see that we only have coefficients for Medium/High values of these variables, so they are offset from the reference slope. The underscore in my variable names denotes an interaction; when X is involved then it’s an effect on the slope of Y on X, whereas otherwise it affects the intercept. Remember, because the coefficients of Z/W are offsets, we add these effects on top of the reference levels. You’ll notice that I specified the level of Z and W as ‘Z:Low’ and ‘W:Low’; while putting the variable name in the value is redundant, you’ll see later why I’ve done this. Now all that’s left to do is to plot the predicted regression slopes from the analysis! First, I call the ggplot2 library. The main function call to ggplot specifies our data frame (df.XWZ), and the variables to be plotted (x,y). Then, ‘geom_line()‘ indicates that I want the observations to be connected by lines. Next, ‘facet_grid‘ asks for this figure to be laid out in a grid of panels; ‘W~Z’ specifies that these panels are to be laid out in rows for values of W and columns for values of Z. Setting ‘as.table’ to FALSE simply means that the highest level of W is at the top, rather than the bottom (as would be the case if it were laid out in table format, but as a figure I find it more intuitive to have the highest level at the top). Finally, ‘theme_bw()’ just gives a nice plain theme that I prefer to ggplot2’s default settings. There we have it! A small multiples plot to show the results of a multiple regression analysis, with each panel showing the relationship between our response variable (Y) and continuous predictor (X) for a unique combination of our 3-level moderators (Z, W). Hopefully this is clear – any questions, please leave a comment. The layout of R script was created by Pretty R at inside-R.org. Thanks again to Rebekah for her question on my previous post, and letting me use her analysis as an example here. Previous PostStatistics workshopNext PostFrom the shadows, they come. Any suggestions for a 3 way interaction with 1 categorical and 2 continuous variables? I use Stata and have been trying to figure out how I can test if there are ethnic differences between muscle (predictor) and bone (outcome) with age? This is perhaps a belated comment given when the post was written, but I am struggling with a similar issue, and found your approach very helpful. However, I have two questions, both related to inference. Do you have some suggestion to add a histogram of the continuous predictor (X in your example) to the background of each grid? Secondly, do you have any suggestion to add confidence intervals to the plots? In my specific case I am running glmer models, I am interested in a continuousXdummyXdummy interation. Also: given that it’s a glmer multivariate model, should I include in the calculation all the fixed effects coefficients of the control variables? how about the random effects? When you say multivariate, I assume you mean that you have multiple predictors (rather than multiple responses)? Using the ‘predict’ function enables you to generate predictions based on user-set combinations of the fixed effects, averaging over the random effects (or for certain levels of the random effects, if that’s your interest). For your control variables, the easiest thing to do is mean-centre and scale them in your model (or, if they are binary, code them as -0.5 and 0.5 such that they have a mean of 0 and difference of 1, useful for comparing effect sizes), and then your dummy data frame can just have 0s for those variables – meaning your predictions are based on average values for all control factors.